Laurencine Lot, photographer. Color photograph, 2007. "The job of a director, in the main, is to preside over certain translations. Translations, for example, from the written to the spoken word, from the general to the specific stage direction… These translations, taken in sum, transform a literary document (words on paper) to a theatrical presentation (actors on a stage). The translations accomplished, the director— not himself a participant in the production— goes home, his catalytic operation completed." He is a director. A teacher. An author. A playwright. A translator. A dramatic critic. A scholar. It all began when he acted in a couple of high school plays and tried his hand at directing at summer camp. 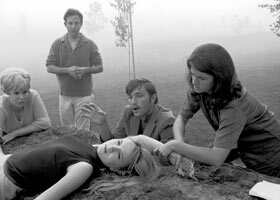 Robert Cohen, Claire Trevor Professor of Drama in the School of the Arts, is a member of UCI’s founding faculty, and one of only a few of our founders who remain active 43 years later. Since arriving in advance of the first year of classes in 1965, he has directed more than 70 productions on campus (including two operas) and 30 on the professional stage, published 12 books on acting and theatre, written new plays and translated classic ones, A renowned teacher of acting, directing, and dramatic literature, he has been a mentor to countless actors-in-training and continues to be an inspiration to students, alumni, and colleagues. Cohen was inspired toward a life in the theatre by courses in Shakespeare and English literature in high school. He began his university career as a political science major, but realized just before his senior year at UC Berkeley that drama was his true passion. Completing the requirements for both degrees in that final year, he graduated with a double major. A lifetime pattern of prodigious accomplishment was thus established. Not a single professional theatre company existed in Southern California when Cohen arrived on the scene in 1965. South Coast Repertory was an amateur theatre that had just been launched in Newport Beach; he joined as one of the earliest members. In the ensuing four decades, regional theatre has exploded in both popularity and significance throughout the United States, and Robert Cohen has been an important catalyst on the Southern California scene and beyond. 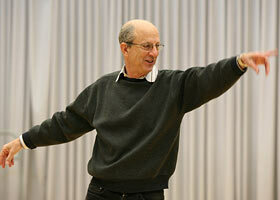 Stage to Stage focuses on Robert Cohen’s productions at UCI. He began with Tennessee Williams’ Night of the Iguana in 1966 and has since brought to life the timeless works of Shakespeare, Molière, Rodgers and Hammerstein, Brecht, Arthur Miller, Edward Albee, Lerner and Loewe, Giraudoux, Sophocles, and many others. The exhibit illustrates his accomplishments as author, director, playwright, translator, teacher, and actor, drawing from the production books he meticulously compiled over the years to preserve programs, annotated scripts, photographs, press releases, cast lists, rehearsal notes and schedules, theatre ground plans, published reviews, costume sketches, and much else, all of which serve to document his directorial record. Captions indicate the year that each play was produced at UCI. Most materials on exhibit are from these production books in the Robert Cohen Papers, which he donated to Special Collections and Archives in 2006. Some photographs were loaned by Professor Cohen; selected photographs and posters are from the publicity archives of the Claire Trevor School of the Arts. Stage to Stage was curated by Jackie Dooley, Head of Special Collections and Archives in the UCI Libraries. She acknowledges the quotations and other source material taken from the oral history interview that Professor Emeritus Spencer Olin conducted with Professor Cohen in 2006 as part of the UCI Historical Records Project.